We recommend to you some restaurants where it is possible to hace a good meal in Chaouen, in addition to the restaurants in Uta el-Hammam square. 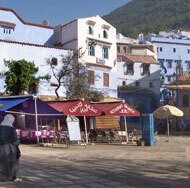 Recommendation in Chaouen.info, establishments and services to host your trip: lodgings, restaurants, stores y activities. If you want more information or if you want to advertise in Chaouen.info, you can contact us by e-mail or telephone. Cosy Rural Hotel sourrounded by nature next to the Medina. Two traditional style apartaments and one suite in Al Andalus.